Located on the Boro River and set amongst the shady trees and water of the Okavango Delta, on a private concession neighbouring the Moremi Game Reserve, Baines' Camp is an exclusive oasis for those wishing to experience the true wilds of Botswana. Baines' Camp is located on a huge private concession bordering the Moremi Game Reserve in the Okavango Delta, home to some of the most spectacular wildlife on Earth. The camp is small and intimate, with only five luxurious suites. This private camp is located by definition in the Okavango's seasonal delta. The flood waters arrive in June, though there is often navigable water all year round due to the presence of the Boro River. The beautifully-appointed tents evoke an atmosphere of "classic Africa," with hand-crafted beds, antique furniture and Thomas Baines paintings combining to create the surroundings of colonial-era luxury. Baines' Camp and it's sister property, Stanley's Camp, are owned and operated by Sanctuary Lodges & Camps. Set in a grove of trees and surrounded by papyrus beds, this low-environmental-impact camp has been built using commercially grown wood and recycled tin cans. The local community in Maun were invited to collect as many cans as they could, and paid a fee for every can collected. These cans were then incorporated into the camp buildings, forming the backbone of the structures. The five tented suites at Baines' Camp are opulent and luxurious, with adjoining outdoor bathrooms and four-poster beds swathed in mosquito netting. Traditional safari ceiling fans create a cooling breeze at even the hottest times of the year. Should you wish, your bed can be wheeled out onto the private wooden deck for a night under the stars overlooking the shimmering waters of the Boro River, where hippo can often be spotted. Avid astronomers will delight in stargazing from the privacy of their own deck. Each room is equipped with a hairdryer, in-room safe and minibar. The camp also provides a torch as well as complimentary mosquito repellant & toiletries. There is a communal swimming pool and the wide wooden deck that surrounds the main dining and sitting room is the ideal place to relax while observing the varied wildlife present here. See prowling lions looking for prey at the edge of the lagoon that the camp overlooks or watch one of the many elephants who live in the area. Here in the Okavango Delta is some of the most spectacular and varied wildlife on Earth. Famed for its big cat and bird population, the Delta is a peaceful haven where animals have been protected for decades and know they will not be disturbed. Guests have the opportunity to see animals up close when expert guides accompany them on morning and evening game drives in open 4 x 4 vehicles. A night game drive is the perfect means to see some of the nocturnal animals one wouldn’t see during the day time. The park also boasts a diversity of landscape with desert, dry savannah, lagoon and swamps in close proximity – cheetah, crocodile and elephant can also be seen on a game drive..
One of the best ways to see the wildlife around Baines’ Camp is in one of the locally made dugout canoes. These used to be carved from ebony but are now made from commercially grown wood and fibreglass to protect the fragile environment of the Okavango. In one of these traditional crafts it is possible to float around the waterways and lagoons that make up the Delta, looking for hippos and crocodiles in the water, but also getting a remarkable view of the plains game from a new and exciting angle. This gentle and informative mode of safari is unique to the river bushmen, comprising three different tribes who made the Delta their home. This activity is subject to water levels. For the less intrepid, Baines' camp also offers motorised speedboats that can be used when the rivers are in flood. The wildlife is spectacular all year round and because the camp is set in a private concession, guests can get very close in perfect safety with one of the guides. Highly trained English speakers, the guides show visitors all the signs of the bush on exciting walks along the animal paths that surround the camp. They can show travellers how to track and follow even the most elusive of animals in the Okavango or introduce guests to some of the 500 bird species that live at this confluence of habitats. Looking at the size of a rhino’s footprint, and tracking the animals nocturnal perambulations is informative, exciting and a little nerve wracking for first-timers. Walking is a levelling experience for many guests, who have only ever driven around in a safari vehicle and enjoyed sitting above lion, elephants and other animals. On foot, one cannot approach these animals, obviously, but learning about them, walking their walk and seeing the bush at their level is a wonderful and educational experience. The choice of activities will not end there. The unique and educational Elephant interaction featured at Stanley's Camp , will be available to guests at Baines’. As part of a unique learning adventure, visitors accompany our semi-habituated herd on daily foraging treks. Immersed in elephant life, warm bonds of kinship grow from a newly found appreciation of these gentle giants. Please note that no riding is offered. 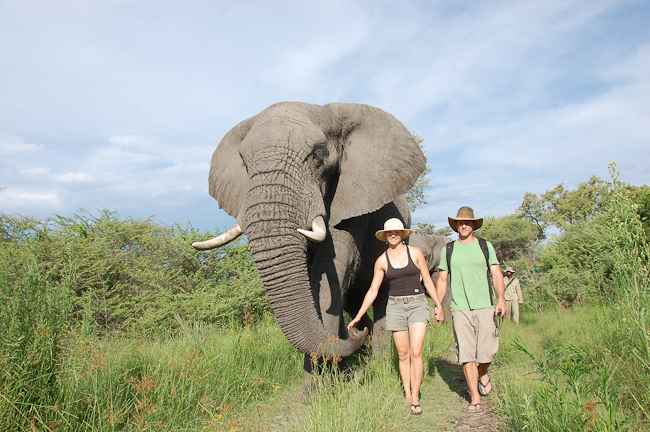 The main objective is to initiate a relationship between the guests and elephants. The activity encompasses a leisurely paced walk with a trio of semi-habituated elephants, becoming personally acquainted with them, observing and interacting with them and a picnic lunch in their company. Duration: 4 hours in the morning culminating in a picnic lunch in the bush. Maximum number of guests: 10 on an activity. Currently, Grey Matters, Doug and Sandi Groves’ Botswana-based company, supports the elephant trio: Jabu, Thembi and Morula. You are invited to discover the elephants, from the bristled ends of their long tails to the tip of their powerful yet sensitive trunks. Marvel at their big ears, thoughtful eyes and enormous padded feet. Trace the textures of their skin and the silken polish of their ivory. Explore the astonishing bonds of kinship forged over more than a decade between the elephants and their guardians in a wilderness of mesmerizing beauty. A delicate blink of Morula’s long lashes reveals her sensitive yet powerful personality. Jabu takes you, trunk in hand, with his bold and generous nature and together you slowly uncover the age-old secrets of the African elephant and the mysteries of the surrounding wilderness. Thembi, cute, boisterous and impossible to ignore, infatuates you and transforms your understanding of elephants to a deeper and more personal level. It is this continuum between people and elephant that Chadwick writes about so eloquently in his book “The Fate of the Elephant”. Elephants can live for 50 years, so when Doug and Sandi Groves adopted Jabu, Thembi and later Morula, rescuing them from culling operations that had left them orphans, they knew they were making a life-long commitment to the trio. Jabu, short for Jabulani, a Zulu name, means happiness and indeed Jabu’s zest for life is inspiring. Jabu is a proud and handsome bull, who enjoys his role as alpha elephant of the small herd. He is kind, playful, generous, big-hearted and dependable. Of the three elephants he is the most independent and confident. Jabu loves interacting and building solid relationships based on mutual trust and respect. He is predictable and unconditional in his giving. Thembi, is a common Zulu name meaning trust. Thembi is the sweetheart of the herd and the smallest in stature. Perfectly formed, pretty and dainty, Thembi knows a few tricks for getting her way. Smart and very social, she loves to be the centre of attention. Morula, is named after a beautiful African fruit tree. Her strongest personality trait is one of great gentleness; she is mild-natured, sensitive and easily bruised emotionally. She can be described as a wallflower but she blossoms beautifully when love and attention are focused directly on her. Morula weaves a powerful magic of her own as in her quiet and subtle way she captures your heart with her sincere, loyal and sweet nature. Doug and Sandi Groves have strived to find ways in which their adopted elephants can act as ambassadors to their wild counterparts. In 1999 the Living With Elephants Foundation (LWE) was launched as an organization that could help the Groves and their trio fulfil their elephant sized dreams. Stanley's Camp offers some of the best game viewing in the Okavango, including Elephant, Buffalo, Giraffe, Hippo, Lion, Leopard, Cheetah and the rare and elusive Wild Dog. The area houses one of the largest buffalo populations in the Okavango Delta, which, in the dry season, can concentrate into a herd in excess of 2000 head. A completely unique Stanley's feature is an educational experience with a group of semi-habituated African Elephants. Spend a day walking with the Elephants and observe them up-close in their natural environment. The area also permits guests the opportunity of viewing the rare Sitatunga antelope.